It has been a cold, cold, snowy winter this year with just one little break a week or so ago for a couple of days. Otherwise it has not been above freezing for most of the winter and the snow has come in abundance, a really old fashioned season like the ones we oldsters can remember from years back. So now that February is about to come to an end, March will arrive and that is the month that brings (or is supposed to) spring! It will get here eventually and is at least two months closer than it was the beginning of January! This last day of February is also my Ray's birthday - had he lived, he would have been 88 today. Here is Lauren lying on her new quilt! I hope she has many hours of fun tummy time -she certainly looks adorable lying there. 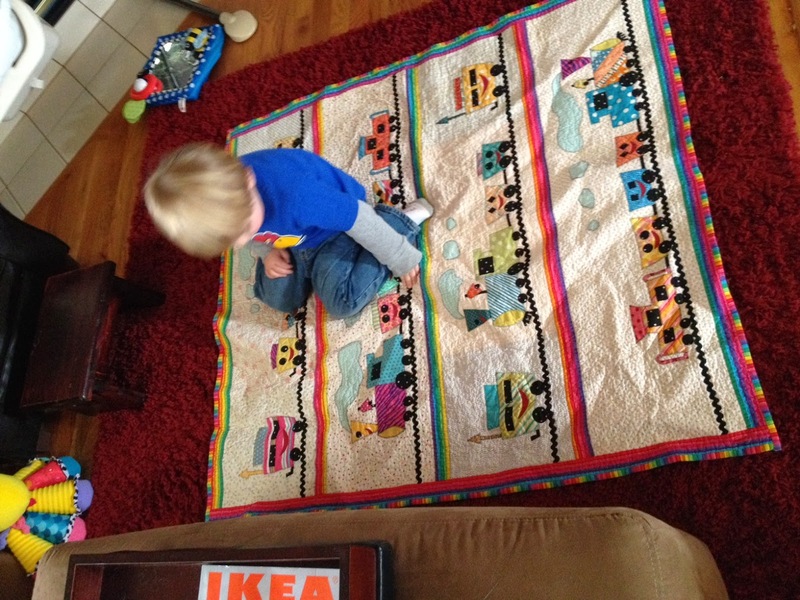 Norah said the quilt brought about a renewal of interest for Henry in the quilt I made him! I know he spent lots of time on his quilt and it looks like it held up well. That is what baby quilts are for - to be used and loved. I'm making good progress on this really colorful top! Spending most of the day working on it. Good thing to do in this cold weather. I don't like going out and don't mind staying in. Tomorrow I about have to make a grocery run and also it's the last day to put the sticker on my license plate so will bite the bullet and do that. Some of the blocks lying on the bed with the white part of the flowers appliqued. 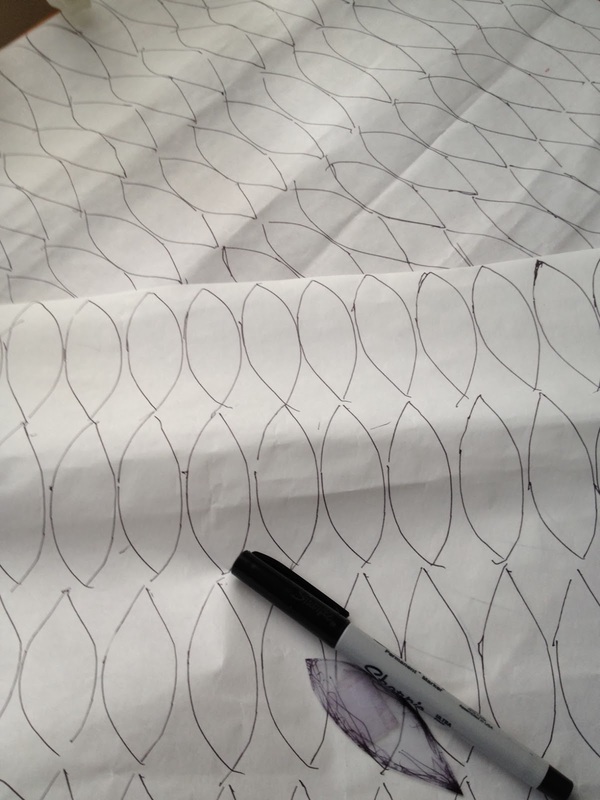 Here are the leaves drawn on fusible web to be ironed to the printed fabrics. Lots of tracing of the template and lots more cutting of leaves. That will be the final big push, though. The applique goes quickly as there are no places that I have to knot the thread since something will go over the edges or they will be in a seam. I will have to secure the threads in the flower centers. Altogether, I will have done 448 leaves. But they are worth it! 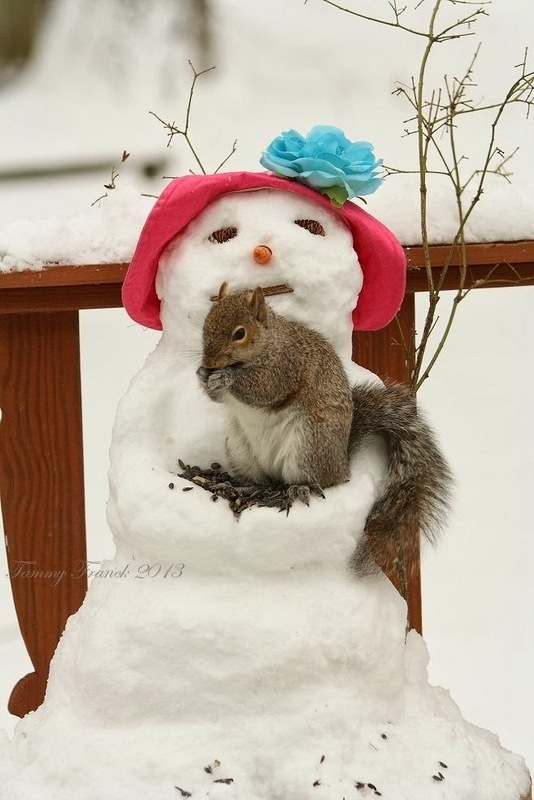 One more thing for the last day of February---the little snowman and squirrel in the picture at the beginning of this post came from my Pinterest Board "The North Wind Doth Blow". I have been on Pinterest for about 2 1/2 years now and enjoy it so much. It's full of gorgeous things, lots of good recipes, patterns, inspiration, eye candy, whatever you want. Today may be the day that I reach 10,000 followers. As of about a minute ago, I had 9995 so it will probably make it sometime today or tonight. I think that's pretty cool for such an old lady. You can look at my boards by clicking the icon at the top of my sidebar. There are tons of quilt pictures and other needlearts, lots of vintage boards, holidays, flowers, etc. etc. I love the twenties and thirties and they are well represented there, too. Pinterest is a fun place! The days pass quickly when I am sewing." This quilt, with the flowers, is going to be a beauty! The baby looks very sweet on her new quilt. I love the picture of the squirrel on the snowman and your quote for today. I love seeing the baby on the quilt. She is a very sweet little girl. And happy on that wonderful quilt. You do such great work my friend. 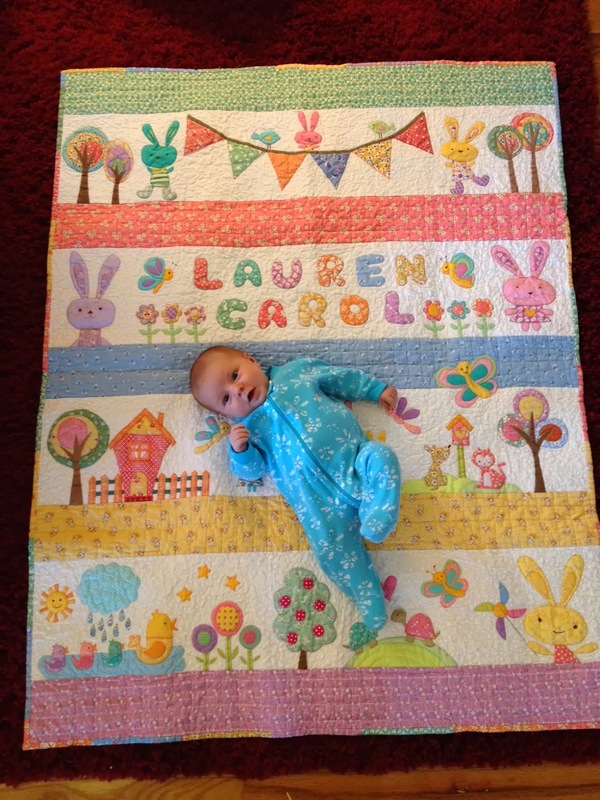 Your quilts are so lovely (very lucky babies to have such a quilt!). 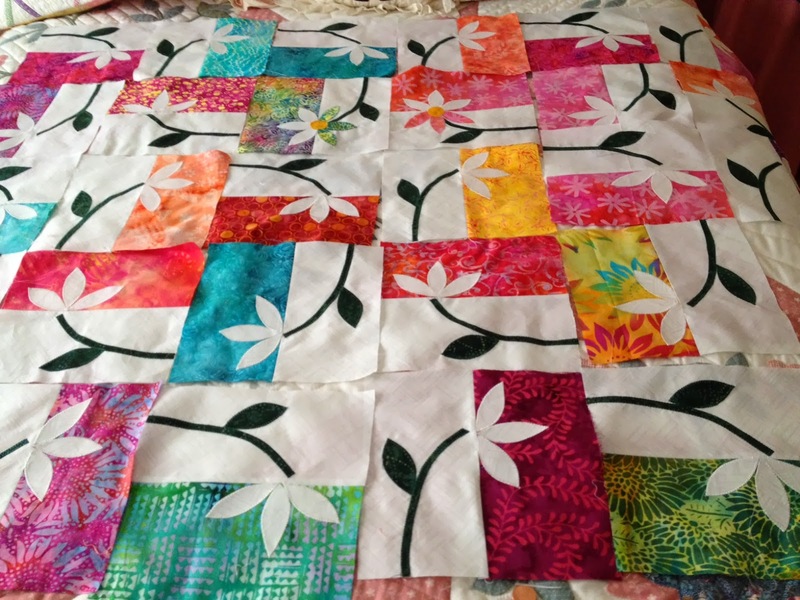 Love your new flower quilt--seems the perfect antidote to dreary winter days! Haha-love the squirrel! 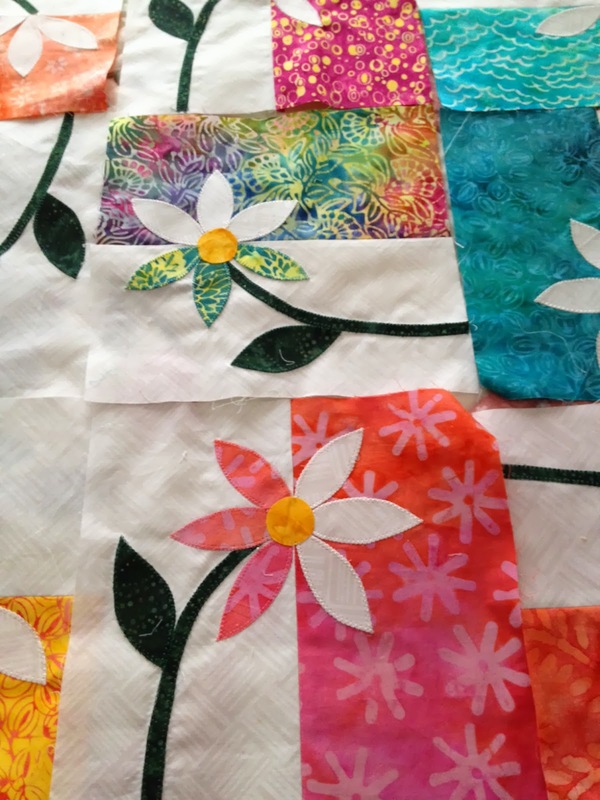 Your flower quilt is beautiful--is it from a pattern? Love your quilts especially the ones you made for your grandchildren.. The colorful daisy quilt is cute as can be, can you please tell me the size of the background pieces - the white bad batik rectangles. It will be a stunning quilt.